At this point in time, the vast choice of yeasts is currently at its utmost peak and some yeasts are well worth the hassle to cultivate and create new brews with, free of charge. 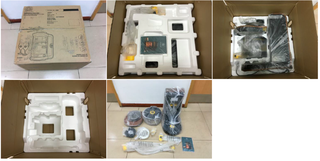 Of course, it is necessary for the beer you want to recover yeast from to be unfiltered, unpasteurized and refermented in bottles to carry out this operation. The amount of yeast in the bottom of the bottle is naturally not sufficient to directly start the fermentation of a whole brew. Hence we need to use leaven to promote cell multiplication of the yeast. We must anticipate this step because it takes several days for the leaven to be operational. 1. 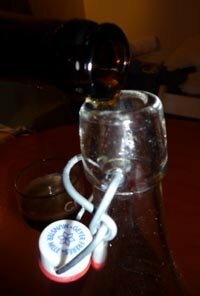 Get a bottle of a recently brewed beer to obtain some fresh yeast from it. Store it vertically in a cool place to promote the sedimentation of the deposit. 2. 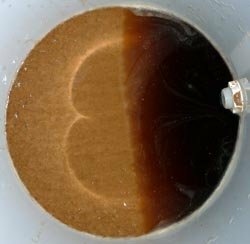 Recover 25-50cL of wort from a previous brew which you will want to brew with, or alternatively prepare a syrup of sugar in boiling water or even dilute your chosen malt extract in boiling water (about 100g of extract or sugar for 1/2L). 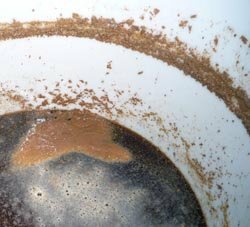 The wort is preferred in order to accustom the yeast to its future environment and to favor its growth (in terms of acidity, bitterness and density). 3. 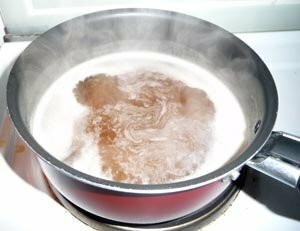 Boil the wort or the syrup to sterilize it and then pour it still boiling in a large bottle with a mechanical cap (75cL or 1L) or a previously disinfected airtight container. Subsequently, any instrument that comes into contact with the leaven must always be disinfected. Close the bottle and let it cool in a cool water bath. 4. 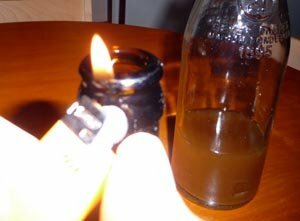 Decap and then disinfect with alcohol or by heating it with a lighter. Slowly pour 3/4 of the bottle into a glass and avoid stirring it too much to keep the deposit at the bottom. 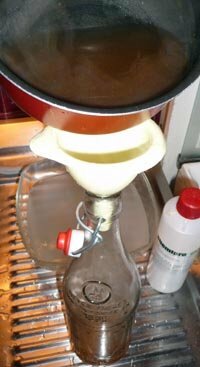 When this step is done, shake the bottom of the bottle to put the yeast deposit in suspension. 5. Carefully pour the bottom of the bottle into the large bottle containing the cooled wort, then close and shake everything. Place the bottle at room temperature (20-25 ° C) to promote cell multiplication. After a few days (2-5), the fermentation resumes if the yeasts are in good health. There should either be the presence or absence of krausen indicating whether the yeast has made a good recovery or not. When the fermentation starts there is also a release of CO2, so you have to depressurize the bottle from time to time to avoid an explosion! The bottle can be kept for several days or even more than a week, it can also be placed in a cool environment to slow down cell activity once the yeast is well resumed. 6. On brewing day, put the bottle at room temperature. Open it just before seeding, disinfect the neck with alcohol and pour the leaven into the brew and stir. The yeast should have grown sufficiently to vigorously ferment the brew. 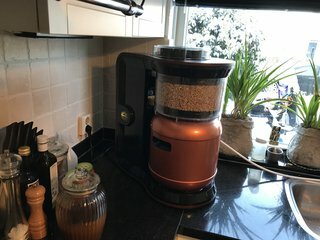 How to recover yeasts from a brew during fermentation stage? For someone who brews often, there is nothing better for yeast recovery than a brew being fermented. It is possible to recover a lot of yeast for (almost) the entire duration of fermentation and even reuse it 8 times in a row before the yeast strain is tired and increases the risk of mutation and infection. This method, unlike the previous one, makes it possible to use the recovered yeast directly. Prepare and disinfect the necessary material: a resealable glass jar and a ladle or a large spoon to cleanly recover the fermentation deposit. At the beginning of the primary fermentation: krausen residues (fermentation foam), which forms after a few days on the surface of the wort or the walls of the fermentor, can be recovered, and is rich in hop resins and in yeasts. 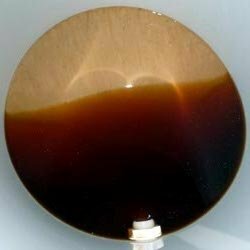 In case you are transferring the tank between the primary and secondary fermentation: once the wort is withdrawn, the whitish deposit at the bottom of tank is a good nest with fresh yeast. Recover a few spoons of this deposit. This does not only contain yeast but also residues of hops, coagulated proteins and dead yeasts. The opaque cloud that can be observed in these residues will disappear with the decantation. During the tank transfer and before bottling: it may be the best time to harvest the yeast because most of the residues have been removed during the first transfer of the tank, but also because at the end of fermentation, the yeast goes dormant and becomes sediment, so its concentration will be stronger. The yeast harvested can then be kept for several days in the fridge. Before reusing, return the jar to room temperature to promote the recovery of the yeast. 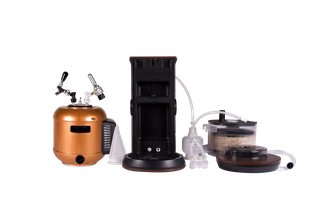 With MiniBrew, thanks to our drip container, you can easily recover the yeast at any of the fermentation stages. 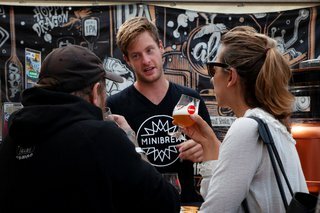 Check out our video on how to brew with the Minibrew to find out how to regain the yeast.